This article is about the microgame. For the Olympic event, see Tennis (Singles). 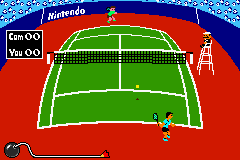 For the series of Mario-themed tennis games, see Mario Tennis (series). Info "Just get to the ball." Tennis is a microgame by 9-Volt in WarioWare: Twisted! It is set in the NES game of the same name. The object is to volley the ball back to the opponent to cause an Out, with a miss by the player causing the referee to call an In. Level 1: The ball will only be sent at the player once. Level 2: The ball will only be sent once, but its path is curved. Level 3: The ball becomes somewhat invisible as it passes the net, then quickly reappears.